If art collectors collected furniture, they'd shop for pieces from Rapaport Designs. 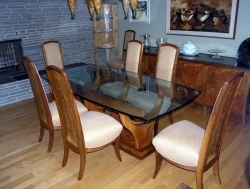 In fact, art collectors do collect furniture, and they commission Rapaport Designs. They're drawn to custom contemporary furniture that explores shapes, yet is sturdily built and long-lasting. And so, very likely, are you. "I'm always trying to do something that I don't see everywhere else," says Mason, explaining his custom made furniture's appeal in a world of mass-production. Rapaport Designs larger pieces — a custom bookcase or wall unit — can look like architectural woodwork, his smaller pieces — an end table, coffee table, or chair — feel sculptural. "I use different glues, and techniques, but they're the same woodworking principles as those used 100 or 150 years ago," explains Mason. You could even call them "handmade furniture designs," since he still draws freehand, in addition to using CAD. The wood dictates his choice of tool: Sometimes hand planning is best, sometimes he'll use a router and jigs to shape the wood. The result is unquestionably custom handcrafted furniture, but with a modern twist. "I use veneers mainly on many of my pieces, which all have a curved element to them," Mason says. "For most of the work I bend veneer over 1/8-inch Italian Poplar plywood or 1/16-inch Finland Birch plywood using a form in a vacuum press. It opens up an endless combination of ideas." And for buyers, an endless combination of furniture pieces that delight the eye.